Just when I thought I was through with Nestle® Toll House® Cookies and different names for roadways, one of you provided me with a word I’d never heard of before: snickelway. Imagine my excitement when I looked it up and found it directly connected to one of my favorite vacation discoveries, York, England. 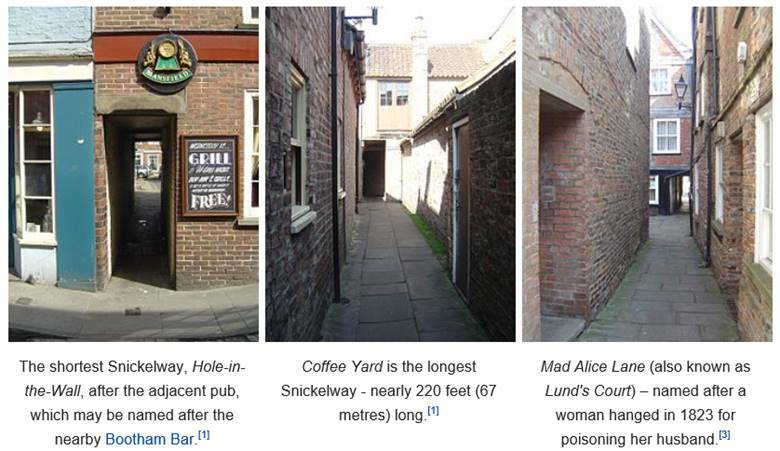 Here are some details and photos about snickelways and the lovely town of York, from Wikipedia. The Snickelways of York, often misspelt snickleways, are a collection of small streets and footpaths in the city of York, England. The word snickelway was coined by local author Mark W. Jones in 1983 in his book A Walk Around the Snickelways of York, and is a portmanteau of the words snicket, meaning a passageway between walls or fences, ginnel, a narrow passageway between or through buildings, and alleyway, a narrow street or lane. Although the word is a neologism, it quickly became part of the local vocabulary, and has even been used in official council documents, for example when giving notice of temporary footpath closures. A snickelway is a narrow place to walk along, leading from somewhere to somewhere else, usually in a town or city, especially in the city of York. York has many such paths, mostly mediaeval, though there are some modern paths as well. They have names like any other city street, often quirky names such as Mad Alice Lane, Nether Hornpot Lane, and even Finkle Street (formerly Mucky Peg Lane). In 1983 Jones devised a walk taking in 50 snickelways within the city walls. His book, A Walk around the Snickelways of York, soon became a local bestseller. It was unusual in being completely hand-written rather than using printed text, with hand-drawn illustrations, a technique which Jones explicitly acknowledged as inspired by the Pictorial Guides of Alfred Wainwright. At least nine editions of the book have been published, each revision incorporating necessary changes, such as the closure of snickelways which were not public rights of way or the opening of new paths. Ready to plan a trip to York? Here are some other great sites to see (York), though I did NOT enjoy the ride at the Jorvik Viking Center, which was enhanced with what I’ll call “smell-o-vision.” They gave you a “tour” of an old Viking town and provided a whiff of everything…and I mean everything that’s part of daily life. Not cool!